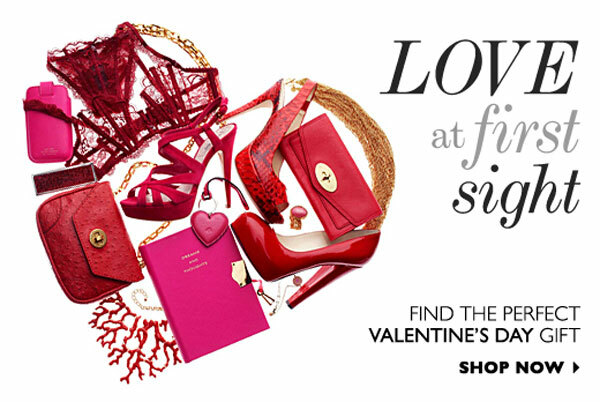 Last week I got an email from Net-A-Porter telling me about their Valentine's Day shop, but I figured I would wait until it was actually February to post about it. I am not much of a Valentine's Day fan since I've never had a Valentine :( but I do love me some red and pink clothes/accessories!! So here are some cute items from that section so you can give your significant other some hints; or if you, like me, won't have a Valentine you can get it for yourself! Click the images to learn more and to buy! The YSL ring still is one of my favorites, allthough i prefer the blue one.. You did a great job ones again! Oooh that ring is heavenly! Don't worry, I've never been much of a Valentine's Day fan either, and I've been married for 11 years! We don't celebrate because--well, I never saw the point, lol. I would re-consider for that satchel, though. ugh, that mulberry bag. i wish! i like - i will check it out! Very nice! I'm totally trying to subtly hint to my boyfriend that I want a FiloFax for Valentines Day. I hope he gets the hint, though a new bag or pair of shoes wouldn't be too bad! I have been drooling over the YSL every since it surfaced, even put it on the xmas list. Time to add it to the V-Day list! :) Great post! Suhweet! I love Valentine's Day for all the cute stuff. I'm trying to watch my spendings so I probably won't buy any of these, but that doesn't mean I wouldn't love having them! that ps bag is soo to die for! That Proenza bag is HEAVENLY and that YSL ring is sTUNNNING!!! WOWOWOWO!!! What a post..my heart is POUNDING!!! all I need now, are some cinnamon hearts!!! That ring is absurdly perfect! Those heels are absolutely to die for. I wish I didn't have such a problem with shoe discomfort so often. Oh my God, everything you featured is gorgeous! I especially love those pale pink pumps. Dying for that PS1 bag- haven't seen it in that color yet! Great post! ...oh boy i sure wouldnt.. I think everyone in the world wants that ring, and I am no exception. The nightwear is supernice too! I have never regretting purchasing that ring! if someone gave me the YSL arty ring as a gift i would probably faint/be completely silent/stare in wonder. perhaps i should stop dropping hints? I love the YSL ring! Love all these shades of red and pink - the brighter the better. These are all good picks. I like the ring, dress, and the shoes. the ring, can't help but love it so much ! Oh yes! Perfect Valentine's Day gifts! YES to the bag and the shoes! So beautiful! I would be a very happy Valentine if I got any of your choices! I love that ring. Check out my blog www.seatomyheart.com ...I am having a super cool giveaway! My bf keeps asking me what I want and I just have no idea what to tell him!! I am really loving the YSL ring though...totally a good idea!! Sure, just make my wish list even longer... I so want that bag! So happy you posted this! Perfect Valentine's inspiration. I've been searcing everywhere for cute red pumps - I love the ones with the peep toe! And you're right, you made an awesome choice with the Marc by Marc Jacobs bag! Oooh this is exactly what us girls want!!! Where is the bf to show him this. Honey?? Look at those shoes.. Aren't they just divine.. The Proenza Schouler bag is so gorgeous in that romantic shade! I could really go for everything in this post! Love the colours! i'm following dear!follow me back? I wish someone would gift me the YSL ring! the little graphic they made is so darn cute!! I totally agree! that YSL ring and PS1 bag would make the perfect valentines gift! !